Many solid fuel appliances are now multi-fuel and can burn both wood and smokeless fuel. 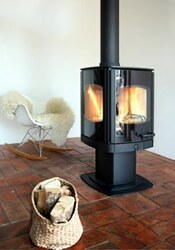 These include open fires, stoves, roomheaters, cookers and freestanding boilers. The manufacturers’ specification will recommend to burn; plus the average output that you can expect by burning the different fuels. Some appliances are manufactured solely for burning wood. They have a solid fuel bed with no bottom grate . However, others can be converted to burn solid mineral fuel by fitting a grate. A grate must be used when you are burning solid mineral fuels as they burn hotter and need combustion air from below. The grate allows any ash to fall away from the fire bed and ensures that cool air is available underneath the grate. You will find information on a selection of manufacturers and importers of wood burning appliances in our links section. Wood burning grates and appliances can be purchased from many stove shops, fireplace showrooms, or selected builders’ merchants. They can also be obtained through heating engineers. Purchasing on the internet or though a warehouse may be perfectly satisfactory so long as you understand the level of technical assistance and support is likely to be less than through the other routes. We would always recommend you consult a registered HETAS installer prior to purchasing an appliance. They will be able to advise whether the chimney you have is satisfactory and whether the proposed appliance is suitable for your heating requirements. Visit the HETAS website, www.hetas.co.uk for a list of HETAS Registered Installers.More information can be obtained by telephoning the Solid Fuel Association on 01773 835400. The most common form of wood fuel at the moment is logs. These will usually come from local sources and can be brought from a variety of outlets – e.g. coal merchants, farmers, tree surgeons. It is important the logs are dry and well seasoned. Burning wet or unseasoned wood is less efficient and can cause harmful build up of deposits in the chimney over a very short time. Thick coatings of creosote or resinous material can cause chimney fires, or prevent the chimney functioning properly. This can allow harmful fumes to escape into the dwelling. Efficient burning is achieved by setting the appliance to burn fast after stoking. This will ensure that all the gases are fully burned. Only set to slow burn when all wood has been reduced to charcoal and ash. Newly added wood set to burn slowly creates smoke and creosote in the chimney. The stove should not be banked up with logs for overnight burning. A bright fire which has turned the wood into charcoal should be left with the day’s ash, no secondary air and minimal primary air. If you buy logs which have not been seasoned, you should store them under cover but open to allow free air circulation for at least a year. Some logs may take 3 to 4 years to fully season. Bring the fuel into the house a few days before you want to use it to get it as dry as possible. Wood from different trees has different heat values The table below provides a useful comparison. Wood fuel has typically less than half the calorific value of coal and smokeless fuel, so you must be prepared to use a greater volume of wood to heat your home or room, unless you use both wood and mineral solid fuel. Under the Weights and Measures Act, coal and smokeless fuel have to be sold in defined weights, which makes it easy for you to compare the cost between suppliers. Unless there is a local statutory instrument in force, there will be no such statutory weight for deliveries of wood. 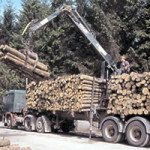 The logs and wood are usually sold in “nets” or by lorry load, so take care to check the amount you can expect to get for your money. Fresh felled wood weights about one tonne per solid cubic metre but will lose up to half its weight when it becomes fully air dried, so find out for how long the wood has been seasoned before delivery. If you burn wood, you should have your chimney swept at least twice a year. Do not burn any painted or treated wood. Treated or painted wood will emit chemicals which are potentially damaging to health and the environment. This also applies to MDF and chipboard. Wood pellets are used on specially designed stoves. 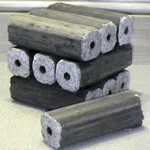 Pellets are typically made from timber waste from sawmills. The wood goes through a fairly lengthy process of transformation before it is finally extruded as hard pellets. In spite of the processing, the fuel is still carbon neutral and so is less harmful to the environment than other fossil fuels. For commercial undertakings, as with any wood fuel, wood pellets do not attract climate change levy tax. There are at present a limited number of pellet producing plants in the UK although there is some encouragement to produce from local sources. Some pellets are being imported in the meantime. The pellets for domestic roomheaters and boilers are being supplied in prepacked bags, usually 10kgs in weight, which makes them a handy size to store and load into the hopper. For the larger boiler models, pellets can be delivered in bulk, but an appropriate silo must be available, connected to the boiler. At the moment most of the pellets will be supplied by the stove shop that markets the boilers, but see our links page below for other suppliers. It is critical to ensure the pellets for domestic stoves are of good quality. European standards are presently being drawn up but in the meantime be aware that pellets generally come in two sizes and the 6mm ones are most common for use in roomheaters/stoves. Good quality pellets will maintain their integrity through the handing process and be made from virgin wood. You should not use wood pellets made from reclaimed wood. It may contain harmful chemicals. Wood chips are generally a by-product of the arboriculture industry or created from waste timber. The fuel is used in screw-fed boilers that have the capacity to fuel local micro-chip systems and larger buildings such as leisure centre, where commercial sized boilers are needed. It is important to ensure stored wood chips do not contain excessive quantities of moisture. These products are manufactured from sawdust and bound or pressed together into a log shape. Some incorporate an inflammable substance that makes the product easy to light. Some are authorised for use in smoke control areas. Heat Logs (pictured right) are a by-product of the sawmill industry and consist of hardwood sawdust at 6% moisture content. This is compacted under high pressure and lignin from the wood itself binds the particles together, removing the need for further chemical additives. Suitable for use on open fires. Relatively expensive but will give a fire lasting for two or three hours. Clean and handy to use and are ideal for a quick fire on a cold night. Can be purchased from supermarkets, garages, other shops as well as from some coal merchants. Wood fuel described as being from a “sustainable” source is obtained from the thinning and management of woodland. This activity can be of benefit to the environment, creating more light and open spaces and potentially increasing biodiversity in the woodland. Wood fuel can be very near to being carbon neutral. It absorbs as much carbon dioxide in its growth as it releases when it is burnt. For this reason, the installation of wood fuel appliances is currently treated more favourably in the Building Regulations. Typical household carbon emissions when using different fuels are shown in the adjoining table. Logs are generally available locally through coal merchants or other suppliers. National supplier of logs, kindling and firewood. FSC accredited for all wood fuel supplies. National supplier of FSC certified wood such as seasoned hardwood logs, kiln-dried pizza logs, as well as eco-friendly heatlogs, wood fuel and firelogs, instant firelogs, and kindling to trade and enduser. Engineers who are registered to install mechanically fed wood and wood pellet systems are listed on the HETAS website www.hetas.co.uk and this speciality is shown on the list of services they provide. For information on Smoke Control Areas, exempt appliances and fuels go to www.uksmokecontrolareas.co.uk.